The New England Outdoor Center “NEOC” is a resort located on Millinocket Lake overlooking Katahdin, Maine’s highest mountain. NEOC is available for meetings and events year round, has on-site accommodation and an award winning Restaurant – The River Driver’s. WHAT TYPES OF GROUPS HAVE MEETINGS AND EVENTS AT NEOC? In the past 12 months we have hosted corporate retreats such as banks, religious groups, Land Conservancy Groups, Military retreats, state-wide groups such as the Warden Services and groups and associations from the medical field. Our facility is open year-round and we host meetings at NEOC and events every month of the year. Meeting and event capacity from 10-200+ people depending on the time of year. 1 ½ Hour drive from Bangor International Airport. 3 ½ Hour drive from Portland Maine. Private planes can land at Millinocket Airport – 10 minutes drive. Sea planes can land right on Millinocket Lake. Shuttle service to Bangor International Airport available. Steak and cheese sandwich with horseradish, caramelized onions & herbs, lettuce, tomato. 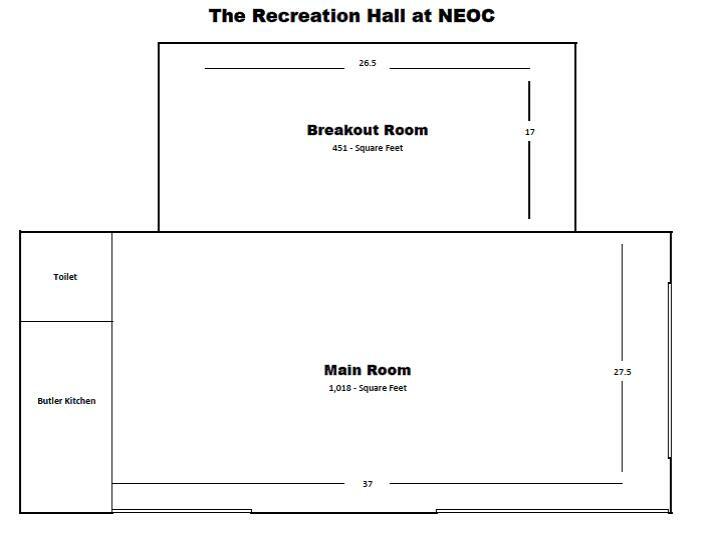 WHAT ACTIVITIES COULD THE GROUP PARTICIPATE IN WHILE AT NEOC? Your time while here can be customized to suit your group’s needs. We can arrange for private whitewater rafting trips on the scenic Penobscot River, guided canoe trips in the Debsconeag Lakes Waterway, guided hikes in and around Baxter State Park or guided fishing in the abundant lakes and streams in the region. Have a riverside lunch and paddle to the Ambejejus Boomhouse, enjoying a visit part of Maine’s logging history. Evenings could be spent around a bonfire on the lake front or enjoying a dinner or a wine tasting in the award winning River Driver’s Restaurant which is located right on site. There are hundreds of miles of hiking trails in the region including those in Baxter State Park, the Katahdin Woods and Waters, the Debsconeag Lakes Wilderness Region and Appalachian Trail to name a few. Depending on the group size we can make a number of recommendations for memorable trips. If you are traveling here in winter – your group will really enjoy guided or self guided snowmobiling trips around and through the Katahdin Region, there is a fleet of over 40 sleds available for large groups and skilled guides available to take you on a journey through this scenic part of Maine. NEOC is also home to cross country ski trails designed by Olympian John Morton – we will groom these trails to suit the group’s requirements – skate skiing, classic skiing, etc. Snowshoeing and fabulous winter hiking trails are also available right from your cabin. WHAT COULD AN ON-SITE EVENT LOOK LIKE? Your group could arrive mid afternoon or early evening and enjoy a welcome reception and dinner in the River Drivers Restaurant. Stay overnight in our full-service accommodation and take a day or two days to have sales meetings or your corporate retreat in our meeting space. We cater all meals in addition to coffee breaks throughout the day. All or a portion of your time here could be spent enjoying group activities or you would be able to accomplish focused meetings with little interaction necessary to the outside world. There are 2 meeting spaces – one is 1,100 sq feet and the other – the River Driver’s main building has over 2,000 sq ft available on 2 floors. The venue offers high ceilings, large windows and tones of natural light, beautiful floors, an AV system with iPod plug-ins, wireless internet, projector & projection screens and a PA system and a wide variety of tables, chairs and other meeting requirements. Seating and meeting capacity can vary depending on the time of year. Year-round meetings and gatherings of 10-60 people happen on a frequent basis. In summer, we can accommodate over 100 people at an event, and with an exterior tent, over 200 people. Planning a wedding or do you know someone who is? Katahdin makes a stunning backdrop and the location is an easy to reach destination for your wedding. All events are catered to right on site through our award winning restaurant – The River Driver’s. We help couples navigate the organizational details and offer all inclusive packages. Customize your wedding from ordinary to extraordinary with options such as planning assistance, a reception tent and a wide range of catering services from our chefs at River Driver’s Restaurant. The River Driver’s was built in 2009 to meet the demand of our growing business. The building has a number features that make it attractive for use year-round. It has high ceilings on the main floor, large windows with views onto Millinocket Lake and Katahdin, easy parking in front of the building, ADA bathrooms and a bar on the main floor. The second floor has views onto the lake and has a conference room suitable for meetings. The entire building can be made available for private use for meetings and functions or a portion of it. This building has hosted weddings, presentations and awards, meetings and banquets as well as wine dinners and group retreats and a good group size for this building is 80-100 people with a tent attached this number can increase to 200 people with ease. The Recreation Hall has 1,018 square feet and offers a 14 ft. pitched ceiling, lots of natural light an AV system with iPod plug-ins and wireless internet and a comfortable mix of tables and chairs to suit your needs. Standing capacity is 75 with a maximum seated dinner capacity of 60 people. The space is private and easily accessed from on-site accommodation. The REC Hall is very adaptable to many kinds of events. Most recently it has been used to host private meetings for corporate retreats, college orientations, outing clubs and lobster bakes. In August the property hosted a film shoot for a Nature Valley commercial and also as a classroom for different adventure initiatives in the North Woods of Maine. With a break out room attached and also adjacent to a number of individual cabins – meeting and break out space happens easily on the property and many groups find it very effective for projects and meetings.